iClicker Plus personal response units are used in many classes on the Rensselar campus. Students who choose to participate in Rensselaer's Mobile Computing Program have the option of purchasing an iClicker Plus at the same time they order their laptop package on-line; students who are not part of the Program can still purchase an iClicker Plus at the Rensselaer Collegiate Store. 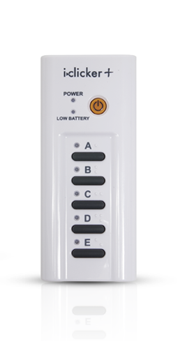 Each student must register their iClicker Plus in order to use them in class. Please refer to the iClicker website for more information on how to register your device. Please note that new registrations of the same iClicker Plus ID overwrite any old ones. Therefore, there is no problem in acquiring a pre-owned iClicker Plus and registering it to yourself. We recommend that students re-register their iClicker Plus at the start of each semester to ensure accuracy of registration. An additional reminder: When registering your iClicker Plus, please use your RCS ID and not your RIN. This is necessary for compatibility with RPILMS, where the user ID is the student's RCS ID.